Back in January 2006, Shiv Sena supremo Bal Thackeray granted the Sena daily newspaper Saamna Editor Sanjay Raut an interview where he spoke his mind about his nephew Raj's departure from the party. Wasn't Rane's exit shocking enough that even Raj Thackeray followed the same path? I and Uddhav had both agreed to whatever suggestions/demands Raj had made. But then who knows some gurus put poison in his ears and he decided to quit the party. Who can be a bigger guru than you? Whoever it is, he must be big in stature and age than Raj. How shocked are you after Raj's exit? Of course, I'm saddened because of his decision to leave the party. I had not really expected this. I have not even in my dreams thought that Raj would leave the Shiv Sena one day. Others would keep coming and going out of the party. But whatever Raj has done has pained me. He seems to have lost his way. Both Raj and Rane have rebelled. Can we keep this topic aside please? He has just gone away from me. We will discuss this when Raj forms his own party or maybe he may not. Write that I spoke these words. However, the question remains that Rane and Raj both left the party on the same issue. No. There's a difference. Rane had alleged that tickets are bought and sold in the party. Raj had asked for a fundamental change in the organisation. He wanted changes in the leadership. I suggested he and Uddhav sit down and solve the matter. You should discuss what exact changes you need to incorporate. We will collectively take a decision after such talks. The matter dragged on for quite a while. His demands were on the structure of the organisation. What can I do if the demands are improper? He alleged that (former Sena legislator) Subhash Desai and his coterie are responsible for this. What could be his (Desai's) interest in creating a rift between Raj and Uddhav? Raj grew up in your arms. Yes, of course. That kid played on my and Maa (Thackeray's late wife Meenatai, who is affectionately called 'Maa' by Shiv Sainiks)'s shoulders. You successfully solved many delicate situations earlier. Why couldn't you solve Raj's problems? What exactly do you want? How am I supposed to know that? What position do you want in the organisation and for whom? If you want to become a leader then you are already one. I have already given other things that he had wanted. One of his allegations was that the Shiv Sena is run like a party of bureaucrats and clerks. That is a part of discipline. No office would run smoothly without clerks and peons. Even in big firms like Reliance or for that matter Tata-Birla firms also have karkoons (clerks). Even the secretariat is being run by these clerks and peons. Even IAS officers are ridiculed as clerks. However, these officers implicitly run the state. We can always sack those who are inefficient. We are prepared for that. The atmosphere got clouded by suspicion and tension. Why were you trying so hard (Saamna editor Sanjay Raut also tried for a rapprochement between cousins Raj and Uddhav but was attacked by Raj's supporters)? So that there's no rancour or split, right? But even you and your car were not spared that day. The anger was against you. For what? Manohar Joshi was with you. Raj should have let the authorities arrest him in Konkan instead of coming back was what you had written in Saamna. Hence the anger on Sanjay Raut. They should have understood your intention before attacking you that day. Uddhav and Raj together could have taken the party ahead. Yes, they could certainly have. They were already doing it. But then what can I do if he strayed midway? The propaganda outside is that you support Raj covertly. I have never done such covert things in the last 40 years as the Shiv Sena supremo. I have done everything openly. I have never had anything to hide. I might have done some things covertly, but then I am not an opportunist and never out of any self-interest. I have never done that. In this entire episode you are being called Dhritharashtra (the blind king and father of the Kauravas in the Mahabharat). Uddhav has already answered this question. 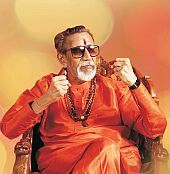 Even if Balasaheb wears black goggles he is not Dhritharashtra. Uddhav was made the president during our party's conclave at Mahabaleshwar. I was not present during that conclave. I was at Matoshree (his bungalow in Bandra, northwest Mumbai). I had asked them to call me after all the preparations were over. Who brought the resolution to make Uddhav party president? Party functionaries brought it and Raj seconded that. Then it was passed unanimously. I did not know anything about this sort would happen at Mahabaleshwar. I am not telling lies, otherwise I would never keep Shivaji Maharaj's statue on the dais. I asked people what was all the celebration about. They said we passed a resolution today that was seconded by Rajsaheb and passed unanimously. We made Uddhav the party president. I asked them frankly to tell me if they acted under any pressure from somebody. They told me the decision was taken unanimously and without anybody's pressure. I told them if you people say that pressure was used I will immediately set aside the unanimous decision. Now Raj is finding the same decision hang around his neck like an albatross. He says he hit a stone on his own leg. What kind of politics is this? Actually, Raj has hit a stone on his own leg by going away from the party. How would you rate Uddhav as a president in this time? He has brought a sense of discipline in the party. He is doing things according to his style. He is also touring a lot these days. His slate is perfectly clean till now. Do you feel that children who go away from you should come back to you? Why ever not? Of course, I feel that way. Definitely yes. All Shiv Sainiks are like my very own children. I love them like my own children. Even they love me a lot. It pains a lot after the ones with whom you have established close relations leave you one day. I become restless even when my Shiv Sainiks get bruised or hurt during agitations. But then innumerable Shiv Sainiks have shed their blood and their lives for the cause of the party and their love for me. I can never forget this as the Shiv Sena pramukh (supremo). This may not be a blood relationship but I can never forget it. How can I forget the sacrifice made by my Shiv Sainiks in the cause of the party's ideology? Even today that Shiv Sainik is prepared to shed his blood for me and his party and that is the only reason why I could bring Shiv Sena to the position and stature it is in now.